A TWENTY-ONE DOG SALUTE TO FREEDOM! 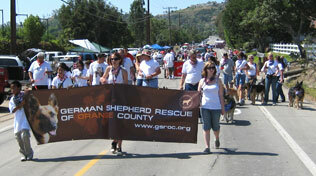 Marching proudly in their red, white and blue bandannas, our orphaned shepherds joined up with GSROC alumnae dogs to strut their stuff in the annual Orange Park Acres 4th of July Parade. The 21 dogs drew applause and good wishes all along the parade route as they held their place among bands, horse units, tricked out cars and home made floats. We could tell from the looks on their faces that the dogs were soaking up the attention; some were even hamming it up a bit. Their name might say German, but today, the shepherds were America’s dogs all the way!